I have only one word to describe this storm: Shocking. Millions of people without power, combined with tree damage, will make this one of the most costly storms in October. 1. What Happened? 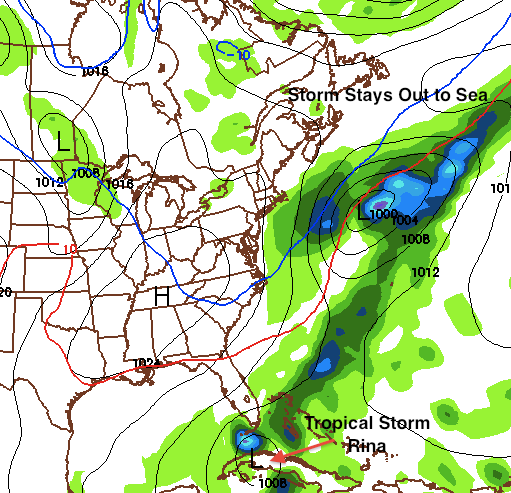 : A nor’easter formed as expected in the Atlantic Ocean. The path of the storm was predicted correctly by the models and meteorologists alike. But, we did not believe that the amount of snow the forecast models projected to fall on Saturday would come true. 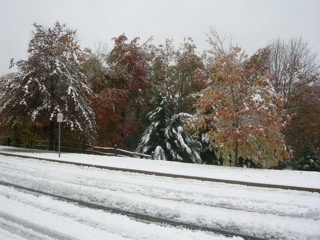 Everyone assumed that it was impossible to have snow totals over a couple of inches in October. When I woke up Saturday morning, I knew something was seriously wrong. I looked out my window to see snowflakes mixing with the rain falling. According to my forecast, I believed that the changeover would not happen until the late afternoon. But, by 11 AM, the rain had changed to all snow north of I-95. At noon, I had lost my power, which did not return until Sunday night. 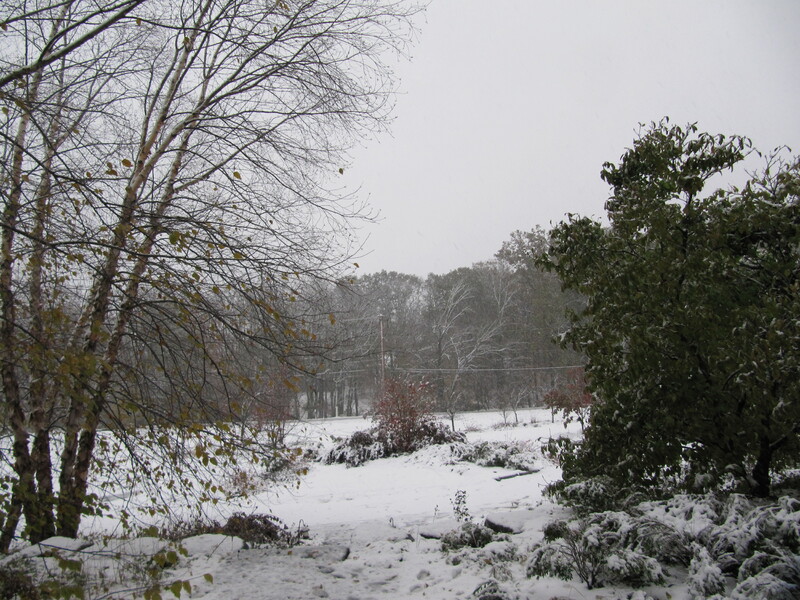 I watched in helplessness during the day Saturday as the snow kept piling up, breaking many tree branches in the process. By the time the storm moved out, there were over 2 million people without power in the Northeast. Why did the changeover occur earlier? There was more cold air in place than expected during the time of the storm. As the nor’easter moved northeastward, it just brought in more cold air. 2. Effects: Peco announced that this storm was the worst October storm in their history. New Jersey is still under a State of Emergency as hundreds of thousands of people are still without power. Many trees were damaged during this storm, creating a lot of cleanup for households and local townships. 3. Opinion: Okay, this is my rant portion of the post. Anger is probably the word that describes how I feel toward the National Weather Service in Mt. Holly right now. On Friday morning, they were calling for a coating to an inch of snow for the NW suburbs of Philadelphia. At that time, most forecast models were showing 4-10 inches of snow to fall in the area, and it seemed that a Winter Storm Watch would be necessary. But instead, they did nothing. The news stations then based their forecasts off of the NWS and their remarks. As a result, most people thought that this storm would be a minor one for the area. There were no salt trucks ready, and people were ready to have a fun Halloween weekend. By the time the snow started falling Saturday morning, the NWS was on it heels, realizing their fault. They raised snowfall totals 6 inches for the suburbs. 6 Inches! My forecast of 2-5 inches for the NW suburbs, was not nearly as bad as the NWS. What baffles me is the fact that these people are professionals. How can an amateur like myself have a better forecast than a whole group of forecasters who majored in meteorology? All in all, we learned a lesson from this storm. It really does not matter that we are in October. 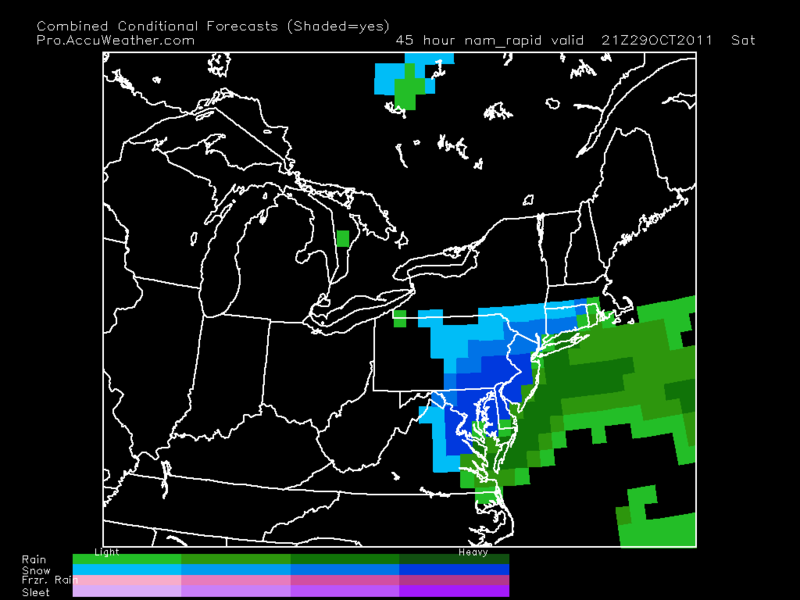 If cold air is in place and a nor’easter is riding the coast, snow will fall. This past storm will undoubtedly serve as a great precedent for any future October snowstorms in our area. WOW. I woke up this morning to a very alarming surprise. Snow was already mixing in with rain at my house in Bucks County. Temperatures are in the mid 30s throughout the region; much colder than what was forecast last night. This means that I may have to raise my snow totals for this storm. Most of the NW suburbs have changed over to rain with snow or all snow. Because we are just at the beginning of this storm, expect the snow to continue until late tonight. The roads will be treacherous tonight. Stay home if possible. This is a major snowstorm we’re dealing with, and our area is not fully prepared for it. Many people will lose power for a time tonight as the snow accumulates on tree branches and power lines. I will update in a few hours on the latest. Its coming folks. The largest October snowstorm to hit the area in recorded history is starting to gain steam in the south as the trough begins to phase together. Right now we are dealing with two pieces of energy, one in the Atlantic and one over the Southeast. By tomorrow morning, these two disturbances will phase and explode, creating a massive nor’easter. Winter storm warnings have been issued by the National Weather service for Chester, Bucks, Montgomery County, and Hunterdon. While a winter weather advisory has been issued for Philadelphia, Delaware, Mercer, Camden, and Burlington counties. Okay, so these are my final totals. Right now, we still do not have the storm’s path nailed down. A small shift east will shift the 6-12 totals into our area, while a shift west will bring the 1-3 totals up. This storm will not be all snow. It will begin as rain as moisture from the South starts to invade the area. 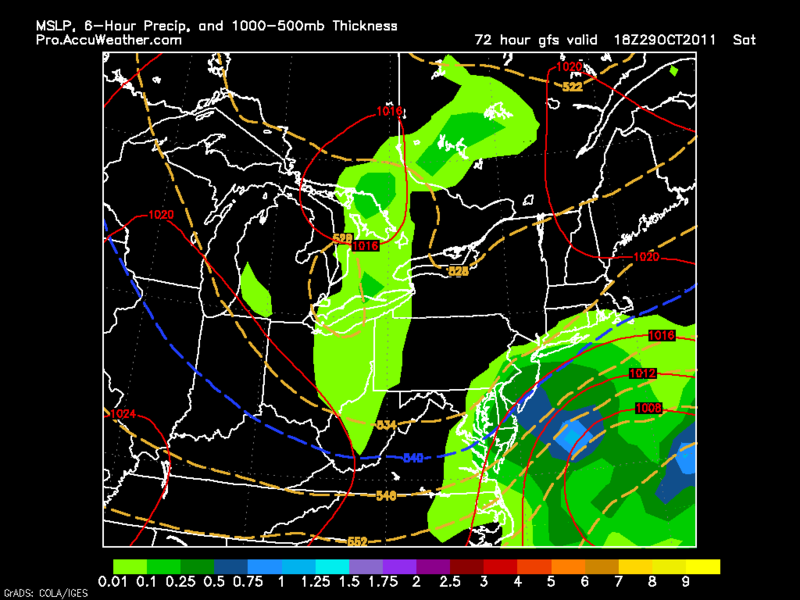 By 2-4 PM, the rain will slowly change to snow as the cold air from the Northwest is brought in by the nor’easter. The key to the amount of snow we receive will be when the changeover to snow occurs. Unfortunately, I, nor any other Meteorologist will be able to pinpoint this time down until it happens. By 8 PM, wet, heavy, snow will be falling north of Philadelphia, weighing down tree branches and power lines. By 4 AM Sunday, the snow should be moving out. Power outages will be major from this storm. Numbers could be in the range we had for Hurricane Irene. Some people, especially to the north, could be out of power for days. The problem for this storm won’t be the roads, but more the tree branches blocking the roads. Snow Totals: Near the coastal regions, I just do not see the rain changing over to complete snow. From Philadelphia to its immediate south and east, we are looking at 1-3 inches. In the NW suburbs, 2-5 inches will fall. In the Lehigh Valley, Poconos, and Susquehanna Valley, 6-12 inches will fall. Final Thoughts: Please be careful on the roads Saturday night! Tree branches will be down all over the place. By Sunday, it will look like January in the area. Halloween will be chilly, and there could be still snow on the ground in the NW suburbs. Enjoy trick or treating in the snow, as it may be a while until we have snow on Halloween! The last few days have been demanding for weather forecasters across the country. 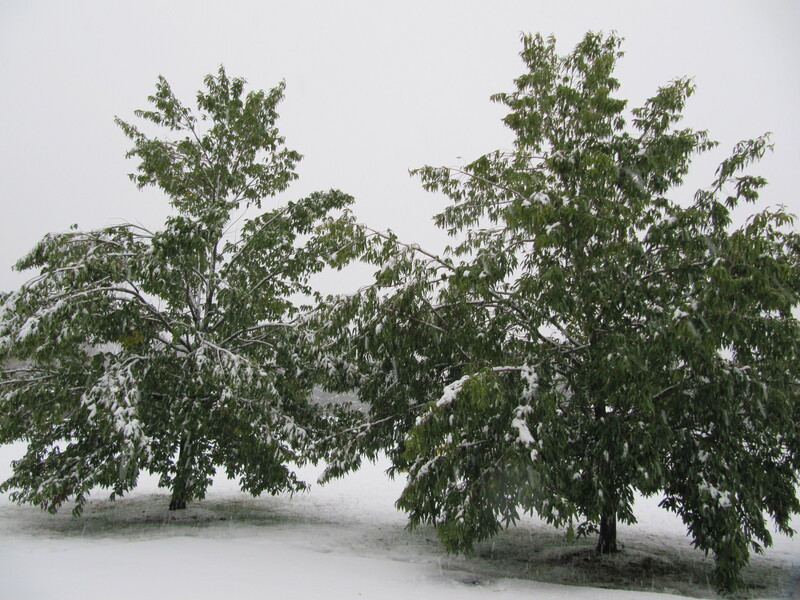 October snowstorms are very hard to nail down. Because of their rarity, meteorologists do not have much history to base their predictions off of. This has been the case for our possible nor’easter on Saturday. A cold front will pass through our area Thursday. Around an inch of rain should fall from this system. After the cold front moves through, it gets complicated. Hurricane Rina (currently in the Caribbean) will start to head toward Florida as the jet stream starts to influence its path. At this point, there are two scenarios (surprise surprise) that could happen. Scenario 1, Out to Sea – Rina stays strong and does not phase with the jet. Sunny day for the Delaware Valley on Saturday. No nor’easter. 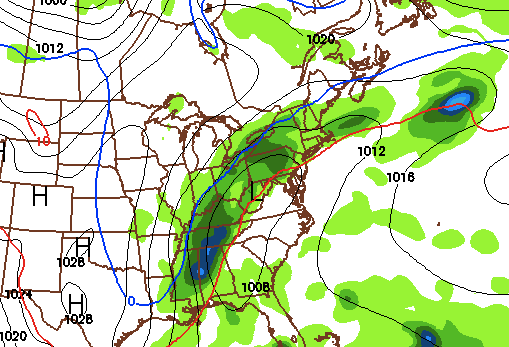 This scenario is supported by a few forecast models, including the famous GFS. 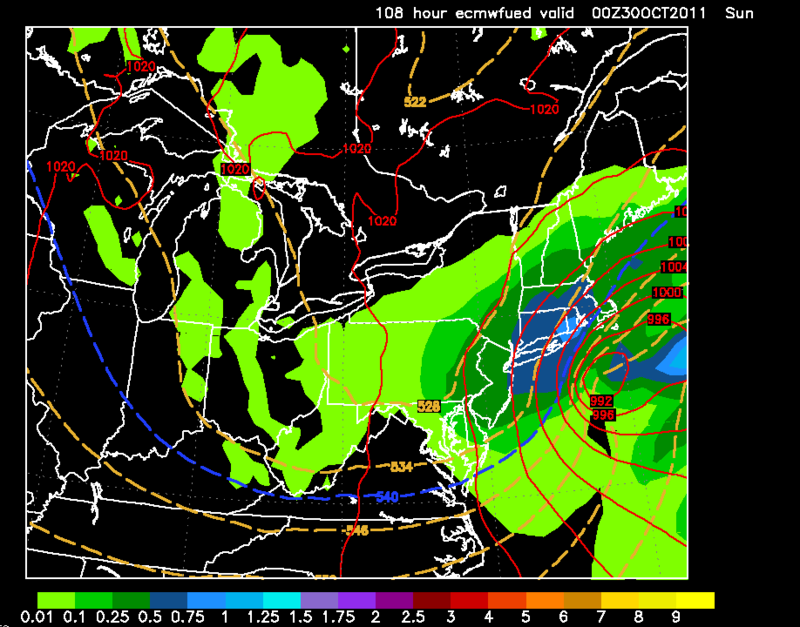 Scenario 2, Snowstorm – Rina weakens and phases with the jet, bringing in cold air and becoming a large nor’easter. This solution would likely bring accumulating snow to our region. As of right now, I am leaning toward this scenario. The forecast model supporting this scenario is known to be the most accurate. Truthfully, I really have no idea what will happen this Saturday. There have not been many October storms to base this prediction on whatsoever. The number of factors involved, combined with the unpredictability of Atlantic tropical systems just adds to the confusion. As we progress through the week, one of these scenarios will become more and more favored. 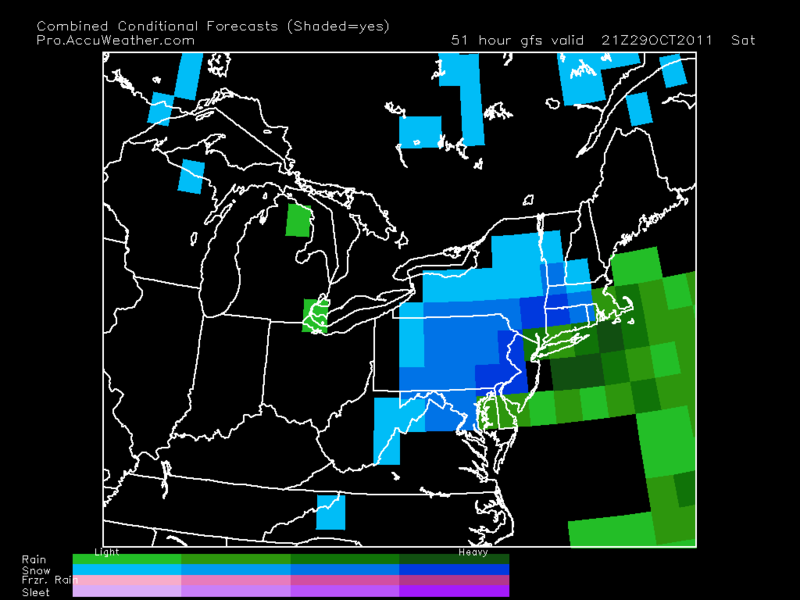 If the models have complete consensus on scenario 2, then I will proceed to make a snow map as soon as possible. If scenario 1 looks more likely, then I will issue a five-day forecast. I will update tomorrow with the latest.